Environmental Arts Festival Scotland is calling for projects connected to land, energy, the coast, rural living, Dark Skies, climate change, and more. Wysing Arts Centre in Cambridge is calling for ideas on the theme of Tracing the Tacit, for retreats exploring the underlying ideas, influences and concepts informing artists’ practices. The work of art in critical times works out on energy, economy and environment at a symposium in Falmouth. Wasteland Conversations in Nottingham take on utopia, community and ecology. Also in Nottingham, and in London, the vacuum cleaner talks: 'I Went Mental and All I Got Was This Lousy T-Shirt' . And in Brussels, Kaaitheater looks at animals looking back for their Burning Ice #6 Festival. Tomorrow, at The Kitchen in New York City, the movement artist Jennifer Monson starts Live Dancing Archive, a week of live performances, video installation and a digital archive. One of the first stories on the Ashden Directory in 2000 featured Jennifer's project BIRD BRAIN Dance, a dance touring project following the migratory pathways of birds and grey whales in the northern and southern hemispheres. Jennifer's work in the UK continued with Water Log, an outdoor movement project across the sands of Morecambe Bay. She returned to America and now is director of iLAND (Interdisciplinary Laboratory for Art, Nature and Dance), developing collaborative art and environmental projects. 'For more than a decade, this esteemed improviser has done most of her dancing outdoors, following the migrations of animals and exploring the connections between dance and scientific research. In Live Dancing Archive, she reconstructs some of those outdoor experiences, attempting to reveal the traces a place might leave on a body. But the work is equally, if even more obliquely, about Monson’s history as a dancer, a queer performer, and an ever-questioning mind'. Superstorm Sandy postponed the simultaneous performances of the climate change opera Auksalaq in two of its seven world-wide venues. Winter storm Nemo may make travel challenging, but tonight, performances in Washington, Virginia and New York are scheduled to go ahead. The form of the opera is the story. Composer Matthew Burtner and media artist Scott Deal, created a system of telecommunications and informatics, a 'telematic', they say reflect the geographies of distance and interconnection. Performers play live in different venues. By video and audio these performances are mixed in one location and sent out via the Internet to the other locations. Audiences contribute via their laptops or cell phones using NOMAD technology. Audience members in any one space will see and hear the live performance happening immediately before them and see the content created in another city. In no single location will the audience perceive the full work. Like an ecosystem, these musical elements create interacting layers that transform into new intricate structures. ‘Auksalaq’ is the Inupiat word for ‘melting snow/ice’. The narrative content is held together with a dramatic account of a boy’s journey, and incorporates testimonials from people in the region, social and political perspectives and scientific information along with characters personifying wind, sun, shifting ice, and clouds. These are layered with visual art, dance and music. 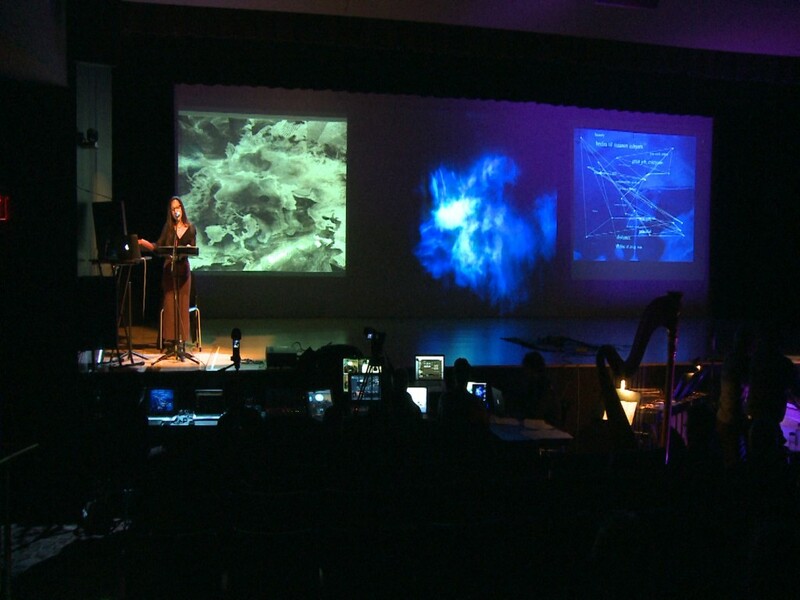 Burtner’s score incorporates sung and spoken voices, instrumental soloists and ensembles, computer-generated sound, video and sonifications, including that of data on ice melt. The technology requires Internet2 and cannot be streamed live. There are sequences from earlier performances here and here. Explanations of how the opera works are here and here. Opening at the Bush Theatre in London, £10,000 in coins come onstage for Money, The Game Show. and Bruce Norris' The Low Road, a fable on the 'natural' cruelty of free market capitalism (image above). Continuing at Nottingham Contemporary, John Newling's exhibition looks at the ecologies of value in the natural world and economic systems.